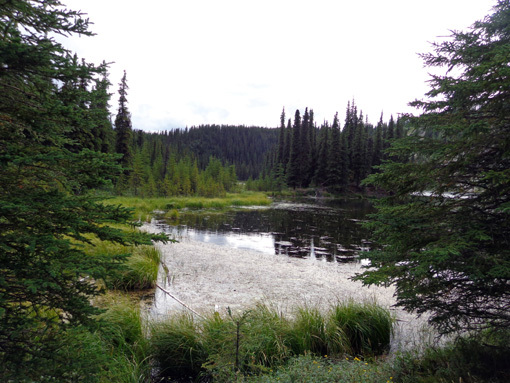 occasional sightings of beavers and other wildlife." This entry is a continuation from the previous entry of today's hike on the Mt. 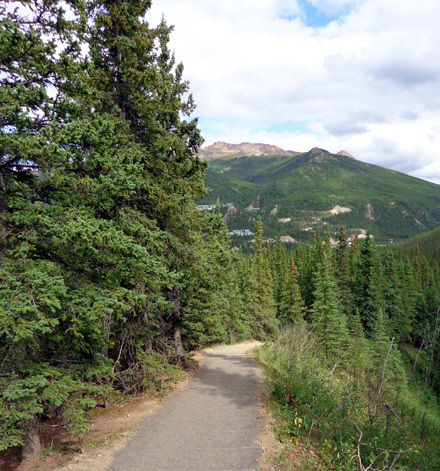 Healy Overlook Trail and Healy Ridge. 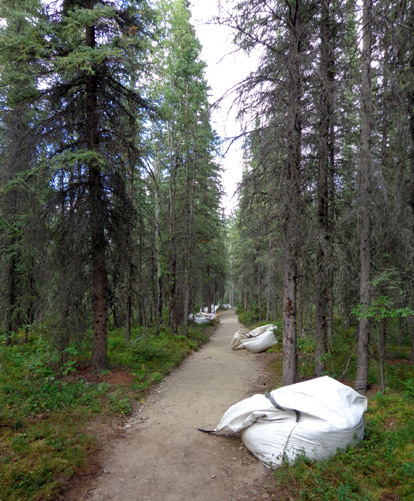 When I got back down to the Taiga Trail trailhead at the railroad tracks I realized I had some time to spare before returning to Riley Creek Campground. 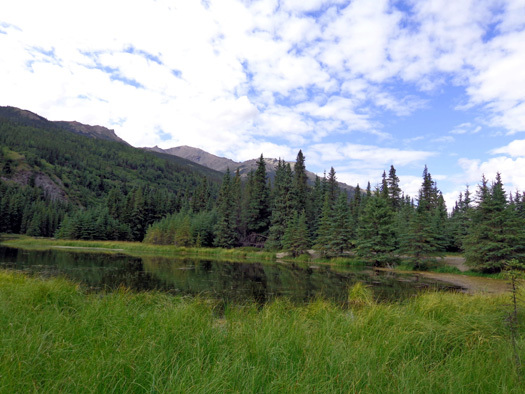 I decided to see what Horseshoe Lake looks like. 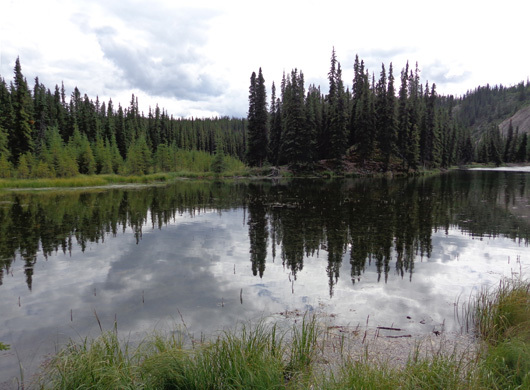 I hiked 8/10ths of a mile 250+ feet down to Horseshoe Lake, a small, scenic U-shaped lake just above the Nenana River. By the time I wandered around part of the shoreline I'd gone over two miles. 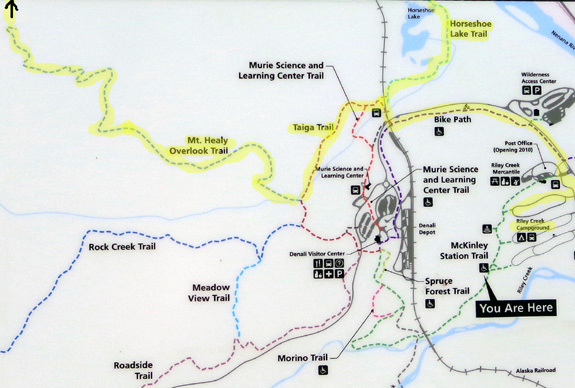 I realized later I missed a spur trail to the riverbank. 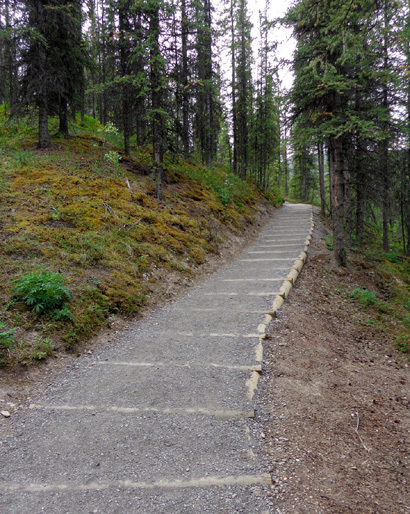 The first part of the trail to the overlook above the lake is definitely easy, with grades of about 5%. 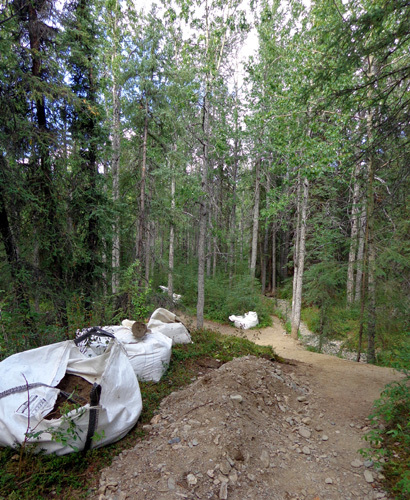 There is a 20% grade going down to the lake and back up in the second two-thirds of the trail. That's pretty steep for people who aren't used to hiking up and down mountains. After just being up on the rougher, steeper Mt. Healy Overlook Trail and Healy Ridge I didn't think the grade on the Horseshoe Lake Trail was very difficult. no water bars used here because the trail is pretty flat. between wooden logs to prevent erosion on the hill down to the lake. The crew was gone when I started my hike . . . When I went down to the lake an hour earlier, the logs weren't there. I guessed they weighed about a ton each and wondered how they were brought in. I ruled out helicopters because of all the tall trees. I figured they were hauled in on heavy-duty ATVs. He said they were indeed brought in by helicopter. They weigh about 1,800 pounds each, so my guess was close. 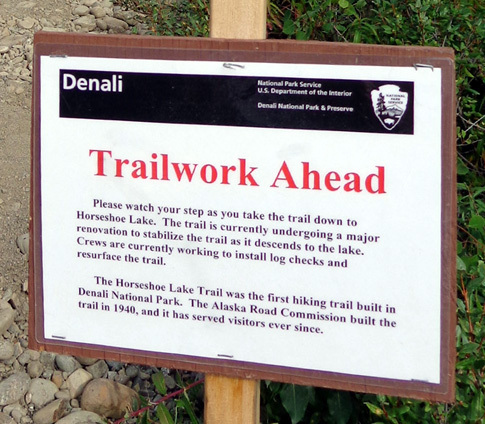 The guy has a farm in Alabama but came to Alaska this summer to work on the trails. 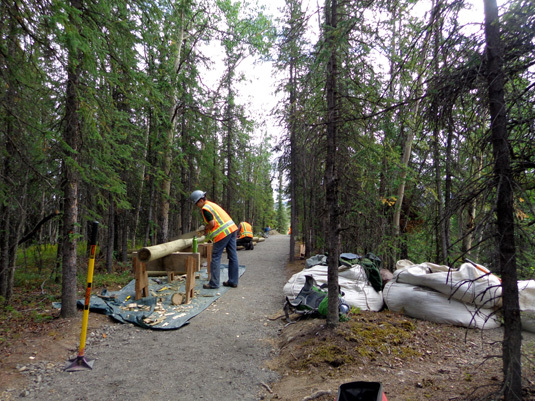 He was very friendly and gave me some good suggestions for hikes and bike rides farther back the park road. 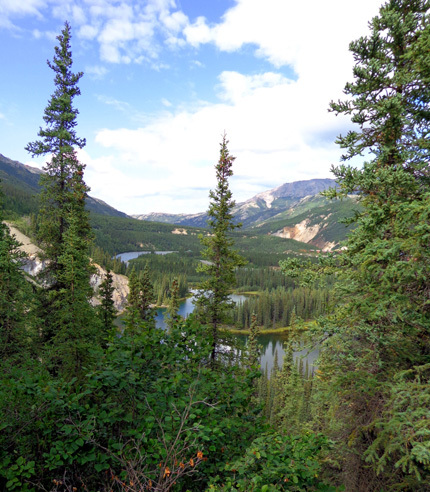 The U-shaped lake is in the foreground, the Nenana River in the distance. Then the trail descends at a 20% grade for several hundred yards. 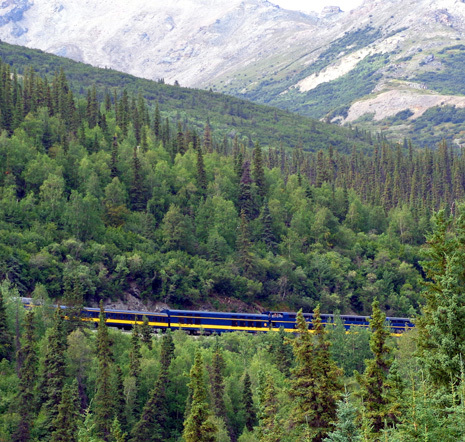 It flattens out the last one-third mile to the lake. 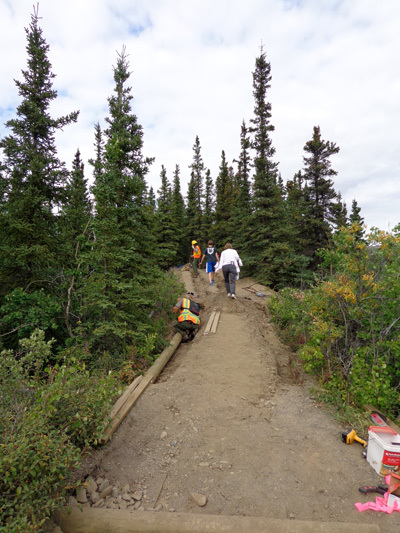 The crew is still working on that part of the trail but it should be nice and smooth by the end of summer. 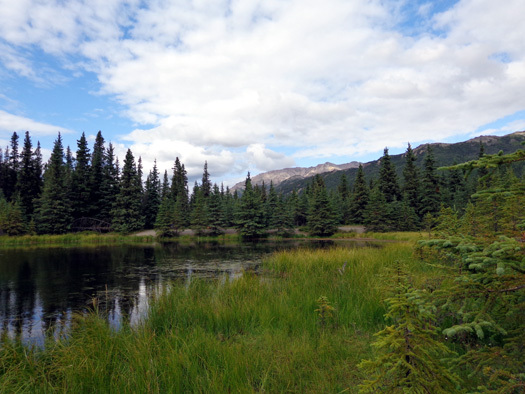 The lake was originally formed by beavers building dams and backing up the water. 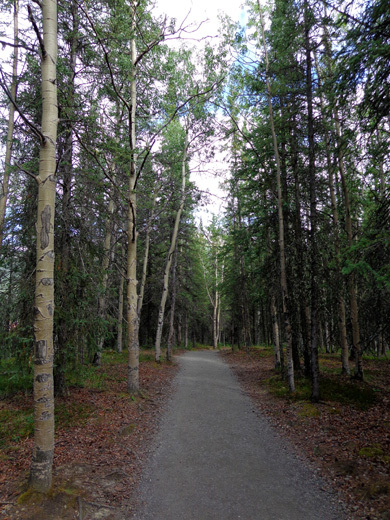 I saw very few people on the Horseshoe Trail this afternoon. More people probably hike there earlier in the day. 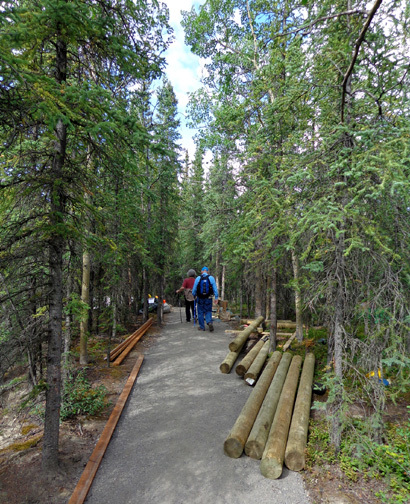 Park rangers also offer guided walks on the trail each morning. 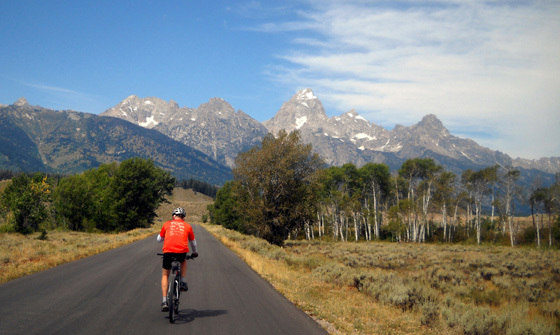 I returned to the camper via the bike path, completing a great hike of about 11 miles. 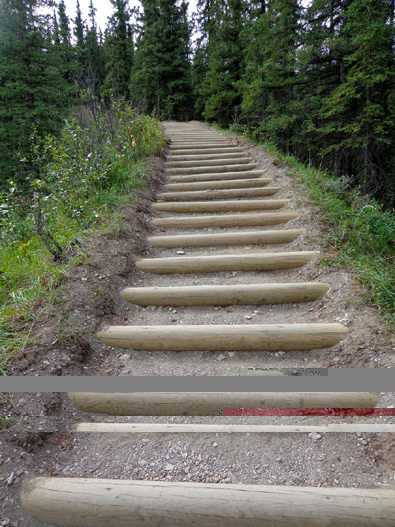 I highly recommend either or both parts of the hike up to the Mt. Healy Overlook and Horseshoe Lake. 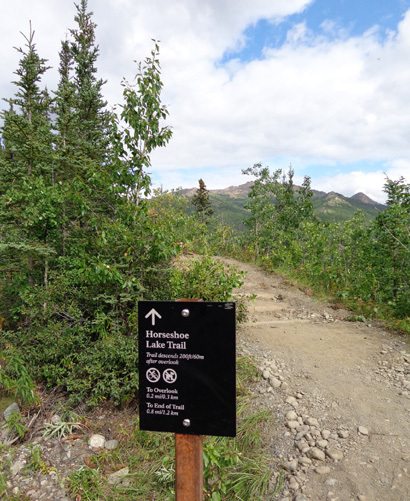 If you're in good shape, I encourage you to go beyond the "end of maintained trail" and explore Healy Ridge as far as you can go. 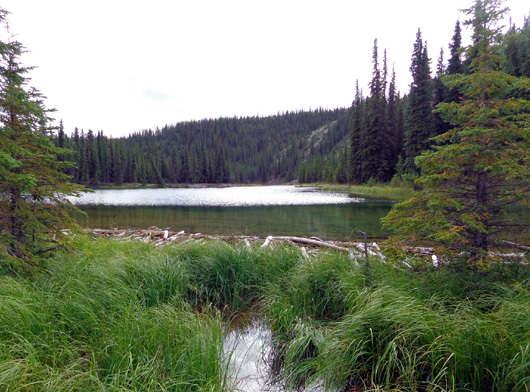 On that or a separate hike, continue down to Horseshoe Lake and walk around since you're in the vicinity. 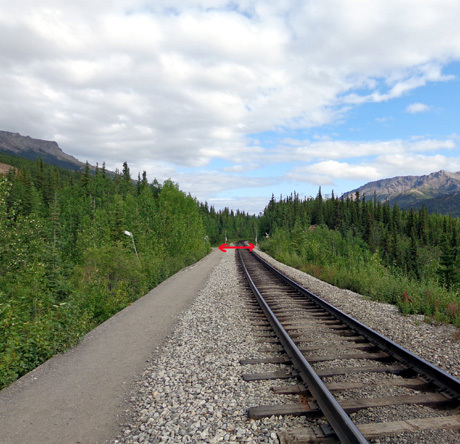 If you don't have that much time or aren't used to rough trails or much elevation change, just hike out a ways on the Taiga Trail and back to the trailhead by the railroad tracks. 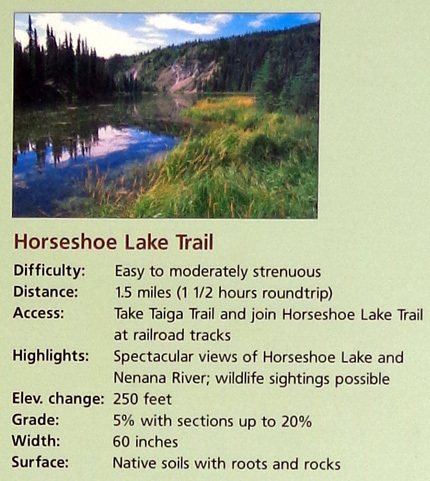 At Horseshoe Lake, just walk about 1/3 mile to the overlook above the lake. Next entry: We went to bed tonight wondering what the weather will be like tomorrow for our plane flight over Denali . . .